He flew out my front door up toward roof I ran out there n didn't see him.anymore. I have highway 27 in Tallahassee lake Jackson area behind my house. I went looking in median n side if road but didn't see him. 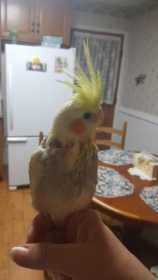 I'm in point view area on sky view Dr . he is beautiful bright yellow with grey and super orange cheeks. Says Hi Baby a lot. He a yr old.